In 1929 there was very little shingle on the four beaches between the two promenade groynes - Banjo Groyne built in 1877 and Black Rock Groyne, completed in 1895. 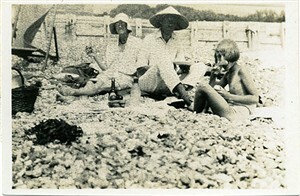 The four beaches between, known to us then as Black Rock, Sussex Square, Chichester and Paston, were formed by three long high groynes which were completely exposed at low tide. 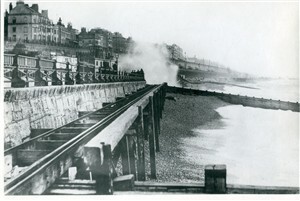 Some shingle built up to the west of these groynes but there was always a deep drop on the eastern side which necessitated Volk's Electric Railway lines being up on pylons for part of the journey, particularly to the east of the Banjo Groyne, hence the advertisement, "Over the Sea in Places". Paston beach was all sand at low tide but the other three beaches were very rocky and not suitable for low-tide swimming. A sign of the ability to get on the sand or rocks when swimming was the exposure of the collection of black mussels on the groynes as the tide went out. (This still applies to this day). 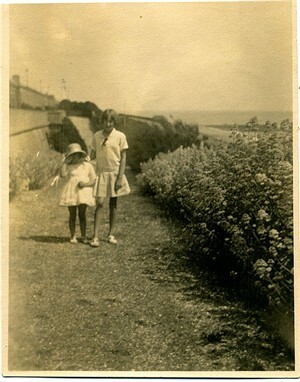 Because we lived in Sussex Square, we had the use of the private gardens known as the Kemp Town Enclosures, with the tunnel under the main road linking the middle gardens with "The Slopes" and a gate directly opposite Black Rock Beach. Thus it was that, aged 5, I was on this beach at 6.30 pm on 22nd July 1929 when the tidal wave appeared. The sea was completely calm and the tide very far out exposing all the rocks. The afternoon had become very oppressive, with an almost pink light, and all the grown-ups were predicting a thunder storm. It was time to go home and, very reluctantly, I was packing up my things and having my final look at my beloved sea. As I have extremely long sight I noticed a long black line on the horizon stretching from East to West which seemed to be moving towards the shore. "There's a big wave out there" I said to my mother. Her reaction was immediate. She instructed my sister to take me up on to the terrace outside the tunnel and wait for her there. She then went round all the remaining people on the beach warning them of the impending danger, many of whom she brought into the gardens and up to the safety of the terrace. I remember feeling rather concerned about this, for we were always told never to let strangers into the private gardens. In the safety of our high up position we waiting excitedly as the huge wave came steadily shorewards but those large groynes lived up to their name of "breakwaters" and broke the wave into white water. It rushed up the beach, turning low-tide into high-tide but because the force had been taken out of it, merely splashed up against the 8 foot high wooden sea defence wall at the top of the beach and, much to my disappointment, only splashed over the railway lines and didn't rush over the lower road and into the gardens. Thanks to my long sight and my mother's bravery, no-one on the Black Rock Beach suffered any harm, though people elsewhere were not so lucky. It is a spectacle I will never, ever, forget and one that makes me glad I live on a hill. This page was added on 12/09/2006.